After a lengthy break, our sports team have returned with their sport podcast. 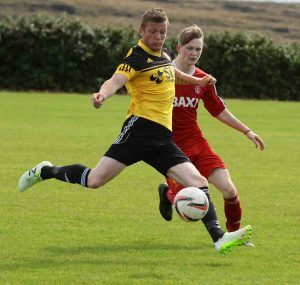 In this episode, Damian, Gerard and Caoimhinn discuss the new Inishowen League soccer season, the addition of a 7th team to the Ulster Senior League, and they also sing the praises of Dundalk FC manager Stephen Kenny. What’s the local link to Stephen Kenny, we hear you ask? Well, the Dubliner has lived in Fahan for many years. 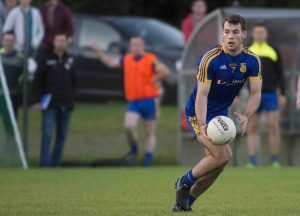 Ahead of a big Gaelic football weekend, the lads touch on Moville’s Division 4 league title win and Buncrana’s promotion to Division 2. Naomh Pádraig’s Aidan McLaughlin pictured during Muff’s Junior quarter final victory over Urris. But mostly they’re previewing the big championship games with Malin v Dungloe in the Donegal senior football championship quarter final (Sunday, 2.30pm); Burt versus Cloughaneely in the intermediate quarter (Saturday 1pm); and Muff’s Friday night Junior semi final clash with Red Hugh’s in Convoy (8pm). Click below to listen, or find us on SoundCloud or iTunes.